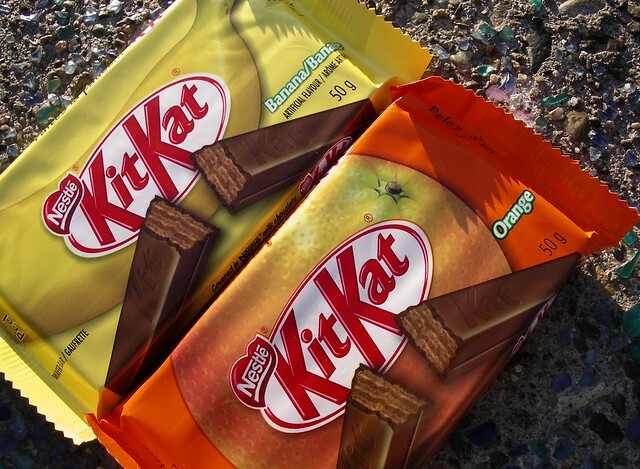 Orange & Banana Kit Kats | Flickr - Photo Sharing! dsmithok, yuvakaew, elisabettapend, and 5 other people added this photo to their favorites. We only have the orange flavoured ones here in the uk :( Is the banana one nice or just really odd tasting? Geez, i can't even find *dark chocolate* KitKats here, and there you are with flavored ones! Yum! KitKats on the beach... Happy memories. I still really want to try the green tea kind, but haven't found any. i've only seen those in japan. Hi selva, I'm an admin for a new group called Have a break, have a KitKat, and we'd love to have your photo (and any other KitKats!) added to the group. Do come and join us!